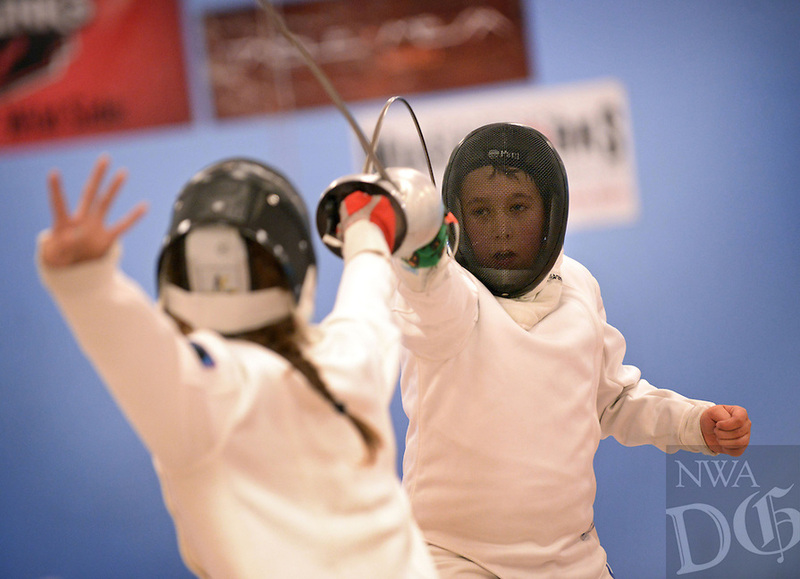 Henry Stone (right), 12, from Oklahoma Sport Fencing in Mustang, Okla., takes on Amelia Palmer, 11, from Texas Fencing Academy in Austin, on Sunday Oct. 18, 2015 in the Y12 epee semifinals during the 3 Swords Regional Youth Circuit fencing tournament at Northwest Arkansas Fencing Center in Bentonville. Stone won the match 15-14 and placed second in the Y12 epee event. The three-day tournament was part of a qualifying path to youth Summer Nationals next year in Salt Lake City, Utah, and proceeds benefitted the Northwest Arkansas Fencing Foundation, the non-profit wing of the Northwest Arkansas Fencing Center dedicated to helping under-served and at-risk youth age 6-18 through the sport of fencing.